Additionally, the test is periodically reviewed and updated to represent current classroom instruction and remain a reliable predictor of college and career readiness. These updates may result in a slight difference between ACT Reading practice test content and the content presented on test day. 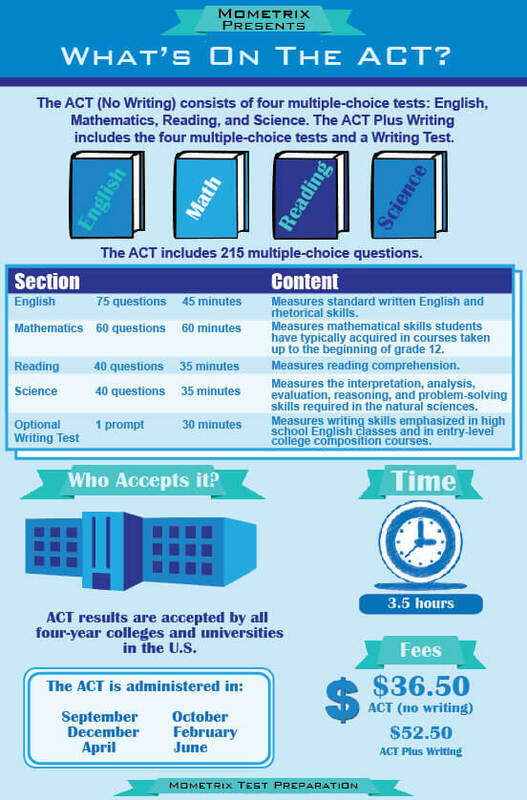 The ACT Reading test is comprised of 40 multiple-choice questions, which you will be asked to respond to within a 35-minute time limit. The questions are broken into four different sections, with three of these sections containing a single long prose passage and one of the sections containing two shorter prose passages. At the beginning of each passage, you will see a headline depicting what type of passage it is, the name(s) of the author(s) and, in some cases, a brief note. Following each passage, you will be given a set of questions about the passage(s) and asked to choose the best response. Keep in mind that there may be several correct responses to these questions, so it is important to pace yourself and take the time to read the passage(s) and each question thoroughly. The questions will not ask you to pull from outside knowledge, instead focusing on the test’s three reporting categories: Craft and Structure, Integration of Knowledge and Ideas and Key Ideas and Details. At the beginning of the test, you will be given a bubble answer sheet. As you record your answers on this bubble sheet, be sure to always double check that the line number of the oval you are filling in matches correctly with the question number you are answering. This is especially critical if you use any time-saving strategies, such as skipping more difficult questions to return to at a later time, as you can accidentally fill in an incorrect oval. If you need to correct or change a response, you can do so by completely erasing the filled-in oval. Take care not to leave any smudges or there could be an error when your test is scored. Your ACT score is based on the number of correct responses with no penalty for any incorrect responses, so guessing on more difficult questions or when you have run out of time can help improve your score without risk of harming it. When you receive your score report, you will see four different scores: one overall test score and three reporting category scores. The 35-minute time limit for the ACT Reading test is enough time for most examinees to read the passages and respond to all of the questions, but you should still pace yourself throughout the test to ensure you have enough time to review your responses by taking between two and three minutes to read each passage and about 30 seconds to answer each of the questions. Always start by reading the entire passage carefully and take note of any relationships between ideas. Then, refer back to the passage as you are answering questions while considering that multiple answer choices may be correct, but there is only one best answer. This best answer should be your response. To most effectively study for your upcoming ACT Reading test and improve your ACT Reading score, you should plan in advance. Your ACT Reading prep should begin with one or multiple ACT Reading practice tests to familiarize yourself with the types of passages and questions you may encounter on test day and identify your strengths and weaknesses. Then, you should use the tools and resources available to you, including those from Mometrix, to review critical concepts.